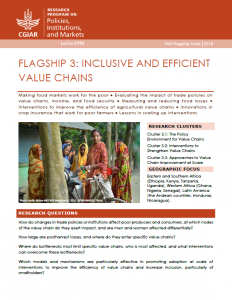 Flagship 3 – Inclusive and Efficient Value Chains addresses the changing international, regional, and local contexts for agricultural markets, and investigates how smallholders, both men and women, can be integrated into the complex and demanding modern marketing arrangements. Researchers examine value chains to understand at which points along them inefficiencies enter and how, who bears the cost of these inefficiencies, and which are most damaging to overall welfare, particularly welfare of smallholders, both men and women, and members of marginalized groups. Measurement of waste and loss along the value chain provides insight into cost-effective remedial measures. Research teams work with businesses, NGOs, and governments to test interventions to strengthen value chains and increase their inclusiveness. 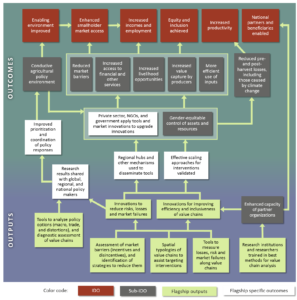 The flagship addresses the enabling environment (global, regional, and domestic) in which value chains operate (Cluster 3.1), identifies weak nodes in the chains, and designs and tests interventions to strengthen these (Cluster 3.2), and provides insights into how interventions found successful in pilots can be adopted on a larger scale (Cluster 3.3). The work on innovative insurance products (incl. picture-based insurance and bundling of insurance and credit products) previously placed in Flagship 4 has been moved to Flagship 3 (in the end of 2017) because of its relevance to smallholder commercialization and access to finance. How do changes in trade policies or institutions affect poor producers and consumers, at which nodes of the value chain do they exert impact, and are men and women affected differentially? 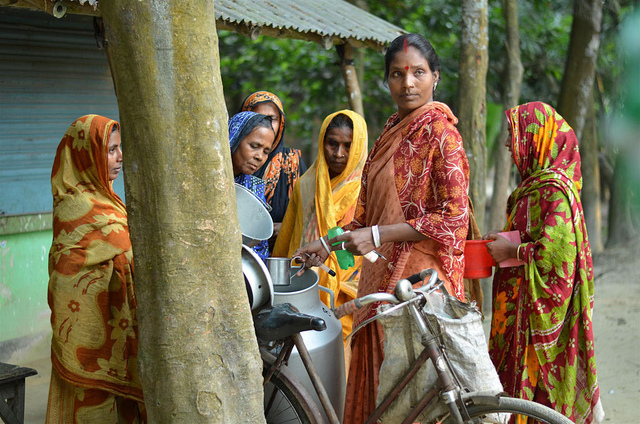 Where do bottlenecks most limit specific value chains, who is most affected, and what interventions can overcome these bottlenecks? How large are postharvest losses, and where do they enter specific value chains? Which models and mechanisms are particularly effective in promoting adoption at scale of interventions to improve the efficiency of value chains and increase inclusion, particularly of smallholders? PIM’s Flagship 3 brings together economists and other scientists from across CGIAR in an active community of practice. In Phase 1, in addition to developing a substantial body of new research and creating a portal to share analytical methods and tools, the team established three regional value chain hubs in Peru, Senegal, and Ethiopia to facilitate dissemination of research results and build capacities of partners to undertake work on value chains. In Phase 2 the hubs’ activities will continue and their contributions will be assessed. Work during Phase 2 will be concentrated around the value chain hubs in Eastern and Southern Africa (Ethiopia, Kenya, Tanzania, Uganda), Western Africa (Ghana, Nigeria, Senegal), and Latin America (the Andean countries, Honduras, Nicaragua). Through collaboration and co-investment with other CGIAR research programs, the Flagship 3 team intends to expand coverage of the flagship in South Asia (Bangladesh, India, Nepal), Southeast Asia (Cambodia, Myanmar, Vietnam), Latin America (Bolivia, Colombia, Ecuador, Guatemala, Haiti, Mexico), and North Africa (Morocco, Tunisia). See PIM Proposal for Phase 2 (2017-2022) for more information. Eastern and Southern Africa (Ethiopia, Kenya, Tanzania, Uganda), Western Africa (Ghana, Nigeria, Senegal), and Latin America (the Andean countries, Honduras, Nicaragua).